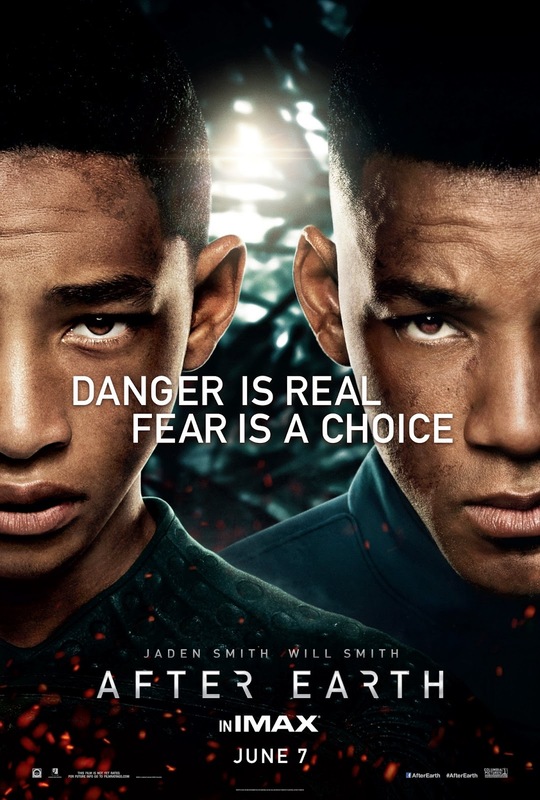 It might have helped going in to After Earth knowing that the director is M. Night Shyamalan, because the movie ended up being a lot scarier than I thought it would be. M. Night likes to keep his audience on edge sometimes, and this was evident in this movie as well. The film ended up being a cross between The Grey and this book series I like, Across the Universe, which made for an interesting combination, and it's crazy to think that Earth may some day be as uninhabitable as it is in this movie. Cypher Raige (Will Smith) is a commander of the Rangers, kind of like the Army. They hunt down Ursas, which are aliens that want to kill humans, and children train to become Rangers, if they wish. Kitai (Jaden Smith), Cypher's son, very much wishes to be a Ranger; however, although he does well in the academic part, he freezes up when "in the field." Cypher is also skilled at Ghosting, which means not having any fear - the Ursas track humans based on the pheromones they emit when they are afraid. Kitai had a sister at one point, Senshi (Zoe Kravitz), but she was killed by an Ursa when he was a little boy, and that motivates him even more to become a Ranger. Cypher brings Kitai with him when the Rangers go on a mission, but the plane crashes and soon it's just Cypher and Kitai who are alive - and Cypher must depend on Kitai to go out of the spacecraft and find its missing piece, which contains a tracker. Only one problem: they've crash-landed on Earth - and there are creatures around that would like nothing more to kill Kitai, including an Ursa that the Rangers brought with them on the trip. This movie was definitely interesting. Cypher and Kitai had strange accents, almost a mix of British and Australian; I'm not sure how this came to be. The Smiths (Will and Jaden) do very well here, as does Zoe Kravitz, in flashbacks, and Sophie Okonedo, as Cypher's wife and Kitai's mother. It was fascinating to see how the humans came to leave Earth, and what they battle now, as well as a brief glimpse of where they now live, on another planet; I would have liked to have seen more of that planet, but the story gets moving quickly and we are soon thrust on to Earth with the rest of the characters. Yes, see this movie. It's not in 3D and I think it actually could have benefited from being in 3D; there are a lot of intense action, flying, and falling sequences. There are a ton of "jump in your seat" type moments, courtesy of Shyamalan, and a few gory/horror-esque things that I was surprised to see ... I didn't know the movie was going to have things like that in it, especially since it's rated PG-13. It reminded me of The Grey because it's a man vs. nature type survival story, and in the book series Across the Universe, they are living in space and trying to reach a different Earth; After Earth is like a combination of these two. It will be interesting to see what Jaden Smith decides to do in the future, too - his father (Will Smith) is helping Jaden's career along, but I wonder if he will decide to be an actor as his life's profession or not; if he does, his face on the silver screen would not be unwelcome, as he's a pretty good actor in most of the movies in which I've seen him. After Earth is in theaters today, May 31st, and is rated PG-13 with a runtime of 100 minutes. 3.5 stars out of 5.